Submissions due Friday, February 1, 2019. We now welcome photographs on the theme of love, community, & home from UC Santa Cruz students for our second annual photo scholarship contest. Examples of prospective submissions can reflect cultural pride, community well-being and empowerment, friendships and companionships, caring for our environment, and the transformative power of love when it comes to romantic relationships and radical political work. Three scholarships will be given to first, second, and third place winners. The winning photographs will be printed 16" x 20" (minimum) and exhibited at the Santa Cruz Museum of Art & History (705 Front Street, Santa Cruz) in April 2019. In addition to content, design, and visual quality, we seek photos that capture this theme in a creative and original manner. Contestants must be currently enrolled and full-time students at UC Santa Cruz in Fall quarter 2018 and Winter quarter 2019. Entries must be original photographs taken by the student submitting them. Color and black-and-white photographs will be considered. Images must be submitted as JPEG (.jpg or .jpeg) or TIFF files, at least 300 dpi and up to 10 MB. Images must be in landscape, portrait, or square orientation. Limit ONE entry per contestant. The photographer’s name, department/major, and UC Santa Cruz email address. A title for the photo and a 1-2 sentence description. Contestants submitting entries depicting individuals must also submit a signed photo release for each individual in the photo. All submissions must be received by 11:59pm on Friday, February 1, 2019. 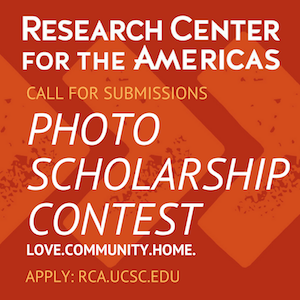 All photographers whose work is selected for prizes or honorable mention must grant unlimited use to the Research Center for the Americas of UC Santa Cruz for promotion of the RCA, with the exclusion of any use that becomes part of a retail product. Photos from selected winners will become part of the Santa Cruz Museum of Art and History archives. Photo credit will be given where appropriate with our style guide. The RCA reserves the right to reject any and all submissions. Technical difficulties? Contact Ms. Jackie Powell at jspowell@ucsc.edu.